Here are set models from Batman Live, an arena show that will tour throughout Britain and Ireland from July-October 2011. 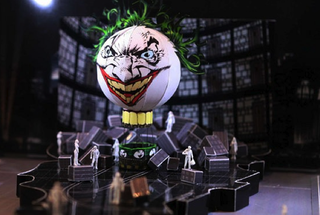 These Jim Lee-influenced dioramas depict a 100-foot-wide, 60-foot-deep stage that will showcase pyrotechnics, a Batmobile, and a Joker dance number. The 85-minute show, which is not quite a play and not quite a stunt show, will run for 11 weeks before moving to the Continent. The show — which is authored by Geoff Johns and kicks off with the origin of Robin — features a giant video wall, a recreation of the Graysons' circus, "and a Joker face whose eyes, teeth and hair are made up of dozens of dancers." Also, none of the scenes last "much over two minutes," so audiences won't see any Bat-monologues. The Batusi, however, has been neither confirmed nor denied.